The Porta Press can be used as a single station or multiple units can be installed as with the Gang Buster. Many customers seek to minimize the size of equipment for light duty applications. A row of Porta Presses can easily replace a massive press brake for tonnage and performance in light duty punching. The Porta Press must be looked at as an alternative to the OBI when buying a punch press. The Porta Press is compact and light weight. At 150 lb, it can easily be moved around the shop vs. the traditional OBI at 1,000 lb that becomes a permanent fixture when it is first located. The Porta Press frame has plenty of vertical adjustment at 5” with a maximum open height of 10” and 5” minimum versus the OBI at typically 2” for a similar tonnage machine. Ram stroke varies from .625” to 3.5” over a number of tonnages. Generally the longer strokes are desirable as these exceed the typical OBI stroke. Double acting cylinders are available that will pull open the die set like the OBI. These cylinders are equipped with a spigot. All other cylinders are single acting pushing down and the die set is opened by springs. We listed the benefits of the Porta Press below and also documented Porta Press typical customer questions about the Porta Press. Instant retraction of press cylinder when foot paddle released. • Instant retraction saves fingers and secondly product and equipment from misfire. • Air compressor is all that is required. • Quick connect plastic hose makes hook up simple. 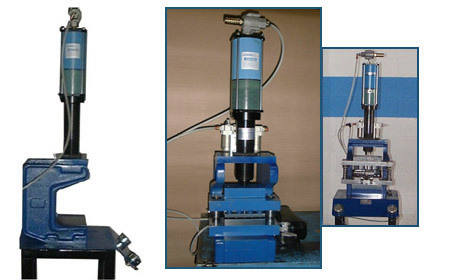 • Porta Press C-frame and cylinder weigh approx. 150 lb Easy to move by hand. • Table top design allows easy work space configuration. • Porta Press conforms to work space and materials. • Greater range of motion of ram for a wider range of applications. • Modular workstation for flexible manufacturing plant. • Quick change die block for tooling and die clamping. Single minute die change with perfect alignment. • Porta Press is virtually maintenance free when the supplied regulator/oiler/separator is maintained. • No mechanical parts or clutch assemblies to brake or require alignment. • No jamming at bottom of stroke from eccentric ram. Call Punch Tools today to see if the Porta Press is the right choice for your application.